Being thin and fit doesn’t make you immune to having fat gather around certain areas of your body; most commonly around the buttocks and thighs (for women) and around the abdomen (for men). But that’s hardly a steadfast rule – women can certainly gather belly fat (most notably, during menopause. Chances are you’re familiar with that?) And there are plenty of men out there sporting big bums and thighs, too. You can exercise. You can diet. But there’s little to no guarantee the fat will come off from the specific body part that bugs you the most. Just because you don’t want it hanging around doesn’t mean it’s listening. Those trouble spots persist despite your best efforts. Studies back this up. Basically, the story is this: The fat that’s broken down to be used as fuel during exercise can come from anywhere in your body – not just where you wish for it to disappear, or for that matter, the part that you work the hardest. Another thing? If you’re not burning enough calories (i.e., expending more than you’re taking in or exercising really, really hard), fat’s not coming off from anywhere in your body. This is perhaps easier to understand digest when you realize that one pound of fat is equivalent to 3500 calories. And typically, the types of exercises you’re doing to spot reduce – like crunches or leg lifts – don’t burn many calories at all. And if you’re not burning calories, you’re not burning fat. News Flash: Since spot reduction is futile in most, fat removal has become such a popular aesthetic treatment, one of the top five. “The gold standard of fat removal used to be liposuction,” says Christine Gould, MD, medical director of All About You Medical Spa located in the town of Fairfield, Connecticut. But liposuction has its downsides: for one thing, it may not be permanent. If you gain weight after the surgery, the fat can return – both to the sites where it was performed and to other sites. What’s more, there may be a wavy or bumpy appearance to the area. And finally, liposuction is an invasive surgical procedure; one that requires both anesthesia and downtime. It’s no wonder that researchers were working hard to come up with something better, easier, more efficient and less invasive. In fact, you can lose up to 24 percent of that fat with each treatment cycle. And that fat stays away – permanently. “Over time, it’s naturally eliminated through your lymphatic system,” Gould explains. Generally the less you need to lose, the less procedures you need. In many cases, patients are happy and see results with only one treatment – but that’s all contingent on your starting point and end goal. Unlike Coolsculpt- the other non-invasive fat removal procedure that’s out there –SculpSure does not use suction to pull the tissues; instead, the device uses light-based technology that is delivered via four hand pieces that lay flat on top of the target area. Depending on the amount of fat you need to lose, between one and five sessions might be necessary. Each cycle only takes 25 minutes and costs an average of $1,500 (depending on where you live and the physician administering the treatment). I was recently invited to try it for myself. “What fat do YOU have?” That question came from a good friend of mine when I revealed my plans. What she didn’t know is this: Although I go to the gym regularly and carefully watch my diet (most of the time), this so-called midlife has inevitably changed my body, just like anyone else’s, and there are some areas around my middle that are rather… disproportionate. Take my love handles. (Please.) They’re there, trust me; looser clothing does wonders to conceal the evidence. How does it work? The applicators fit into a plastic frame to hold them in place. They sit on top of the area that’s being targeted – there’s no pulling or tugging of any kind. The machine was turned on and adjusted to my comfort setting; in the beginning, there’s a cooling sensation, then intervals of warmth deep within the area. Twenty-five minutes later, I got up and drove home. There was no downtime; in fact, I returned to the gym the next day. I felt very slight soreness the next day or so, almost like I’d done one too many crunches at the gym. That’s it. After just one SculpSure treatment. Pretty amazing, huh? Love reading your blog to find out about the most “cutting-edge” beauty treatments/products! Wow, I’m impress whit this treatment, look awesome and the painless thing is a winner. I going to need tons of money to get rid of my love handles… Thanks for sharing. Awesome treatment to reduce fat. Painless, short time and easy treatment without any downtime. I am agree with you that leaving exercise and diet fat returns and when you does not burn your calories you never loss your fat. So , Thanks for this easy and short time treatment. Hi – so, did it work? Hi, Autumn, So sorry for the delayed response. Please see my response to the previous commenters. I am glad to know that there arr so many way to burn fat. That’s really great for those who are suffering from this situation. Great article and very informative for many people. Are you still satisfied with the treatment? I am scheduled to go for it on Monday to treat my abdomen. Yes, Jill, I think the results were good and I found that it helped eliminate some pesky fat! Good luck with your treatment – hope all goes well! I’d love to hear once it’s all done. I scheduled and paid for SculpSure but cancelled two days prior to procedure. I cancelled because I wasn’t sure if I would be covered by medical insurance if something went wrong post-procedure (weeks or months afterwards) that could be linked to Sculpsure. (I called my healthcare provider but didn’t hear back in time). While the investment is worth it cosmetically (I have stubborn fat areas on my abdomen and flanks in spite of exercising 5-6 days a week and eating sensibly for the past three years), I fear draining my savings if something happens and insurance won’t pay. Long story, I know. Other than your website, I haven’t been able to find out about long-term effects given the procedure is so new. I guess my question is this: Are you feeling okay since you had the procedure in May 2016? No, I have not had any problems since my procedure. I was slightly sore the following day, but that disappeared quickly. Since then, I’ve been just fine. I cannot vouch for anyone else, but that is my personal experience. Hope that helps you reach a comfortable decision – good luck! I had it done on my belly December 7. I found the heat to be unbearable and swore I would never do it again! I was told to count to 10 when the heat came on, and it helped, but I couldn’t wait to get thru it! Maybe other parts of the body are different and, of course, everyone reacts differently to heat, but I found it “hot.” No issues afterwards and can’t wait to see what the result is in 8-12 weeks. If it’s successful, I may try the stomach… but we’ll see. Hi, Christy -So sorry for the delay. Please see my comment to Heather, which should answer all your questions. Thanks! I would be.more rpone to follow uou and have my friends follow you if you wiuld put your results on your blog. This is an expensive treatment forost of us. Let us see if it worked for you. Hi Heather – I’m sorry, but I do not wish to post photos of myself, for a number of reasons. One is privacy, another is that the difference was so slight that I don’t feel a photo would demonstrate much. Of course, every person’s experience is different, and a lot of it depends on body type, distribution of fat, etc. Perhaps more treatments would have a different result, but I chose to stop at just one. I hope I answered your question, and I hope the info I provide will keep you reading – thanks for your comment! I just had SculpSure procedure yesterday, I read everywhere that it’s a little uncomfortable but not painful. I had totally different experience. It was very painful , so much so that I had to take a strong pain killer which did nothing to ease the pain . It was pain and suffering for an hour and a half as I had two areas treated. I really hope that it works after one treatment because I definitely are not going to do it ever again. That before and after picture is pretty convincing. 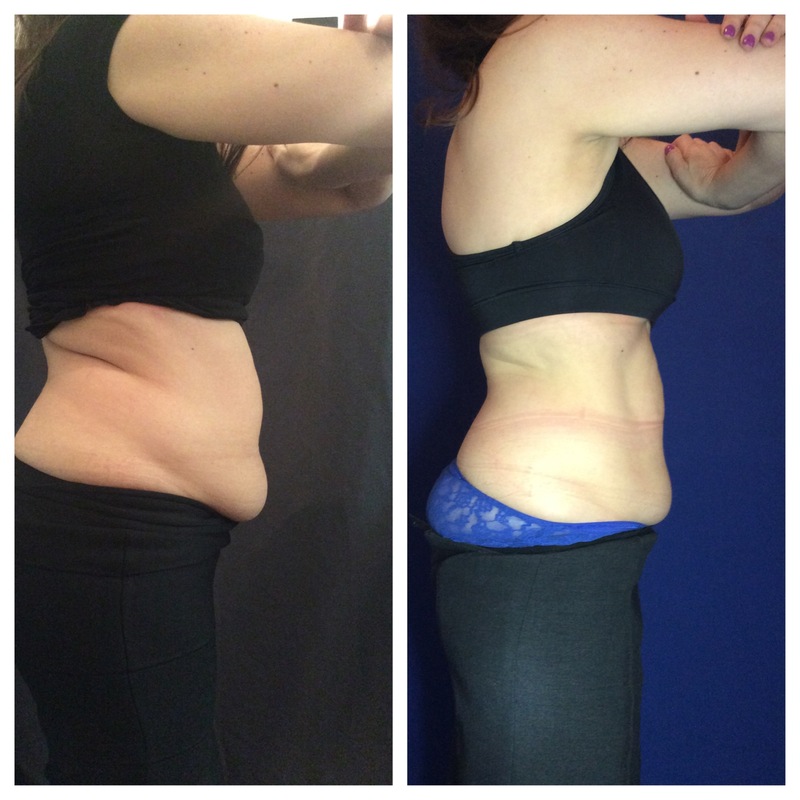 Anyway, according to Dr. Jennessa Iannitelli of Enhanced Image Med Spa, sculpsure is ideal for people with trouble spots especially those that are resistant to diet and exercise, it has minimal side effect during the treatment while with coolsculpting, many individuals might encounter mild bruising, redness or a needles sensation. Your doctor will normally advise you which procedure and treatment plan is best for you. Both non-invasive lipsuction procedure I guess does not work on obesity or too much fat. However, the efficiency of both procedures can be compared as sculpsure may only require one treatment to get good results, while coolsculpting needs 2-4 treatments. Good luck with your “love” handles! Hi Sheryl – how long did it take for you to start to see results? I had Sculpsure 7 weeks ago and still no signs of change. Thank you! Hi, Kathy, The results were so very subtle that it’s tough to say how long it took to notice; but at my followup visit a few weeks later, I did notice a slight change. Hope you did, too! I appreciate your article and for sharing your experience with the readers. However, I would really love to see your before and after photos. It’s hard to determine what type of procedure to do these days when most of the photos are provided by the MD doing the procedure (who stand to make a profit off of the patient) or from the company that makes Sculpsure (thereby promoting it’s machine and making a profit). Most of the photos are stock photos and if you do any digging at all, you will see the same photos being used over and over again by multiple MDs and Sculpsure itself. That’s why the general public relies on the honesty of bloggers or writers, like you, who actually have had the procedure and are willing to provide your own, REAL example of the results. If you are so inclined, I, and I’m sure your other readers, would appreciate a before and after photo. Hello, Julie – So sorry for the delayed response. If you read my reply to Heather, it will explain why I did not post photos. I’m happy to answer any questions you might hav – and thanks for reading and commenting! Weird… I had the sculpture treatment done in Jan and as of today I see ABSOLUTELY NO difference! I’m upset about it because after spending just shy of 2 grand!! And exercising, eating clean and only weighing 125 @ 5’6″ I was really hoping the claims were true. But they are NOT! I would love to go right back to the Wayzata Cosmetic Surgery center and pick up my check so I can go on a trip? I’m so sorry you were not pleased, Becky. Perhaps, if you haven’t already done so, you can speak to the folks there and tell them of your experience. Good luck! Becky. . .. I’m with you! I didn’t get any results! If anything I feel flabbier! After the fact I was told you should do resistance training. Really, i was told people had gotten good results if they did resistance training but didn’t know it was a requirement. I did do resistance training but not every time after my session. What a way to waste my hard earned money !! Thank You for your honesty unlike most people! You’ve saved much heartache ? Sculpture done on my arms and I found the procedure horribly painful. One arm still hurts after 6 weeks. For the moment no result seen at all even if I train hard and limit food intake. I’m sorry to hear that, I do hope time will help heal the pain you are experiencing! lol “painless” I went to get this and I couldn’t even go through with the procedure because I felt like I was about to pass out from the pain. It felt like someone was holding a fire to me and the tech told me I would still need to go 3 levels higher in order to even destroy any fat.